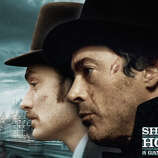 "Sherlock Holmes: A Game of Shadows" is now playing in area movie theaters. Picking up where the 2009 film left off, Dr. John Watson (Jude Law) recalls his "last case" with genius detective Sherlock Holmes (Robert Downey Jr.), whose manic, eccentric behavior verges on psychotic. It's 1891 when Strasbourg and Vienna are rocked by seemingly unrelated series of bombings, escalating tensions between France and Germany. Then an Indian cotton tycoon succumbs to a scandal, a Chinese opium trader suffers an apparent overdose, an American steel magnate dies and seductive Irene Adler (Rachel McAdams) once again surfaces as a courier. Holmes suspects that these seemingly disparate events are the work of a criminal mastermind, diabolical Oxford Professor James Moriarty (Jared Harris), who habitually feeds feral pigeons in parks, when he's not investing in munitions factories -- and the game is afoot. Complicating matters is Watson's marriage to his beloved Mary (Kelly Reilly) and their departure for a honeymoon in Brighton. But plans for a romantic holiday go awry when Holmes unexpectedly turns up in drag in their train compartment, tossing Mary overboard so the detective duo can pursue conspiracy clues gleaned from a mysterious Gypsy fortune teller (Noomi Rapace from the Swedish "Girl With the Dragon Tattoo" trilogy). While Mary's rescued by Holmes' older brother, Mycroft (Stephen Fry), who works in the Foreign Office, Watson and Holmes embark on a merry chase through Europe that takes them from an orchard of prized peaches and onto the stage of the Paris Opera during "Don Giovanni" before culminating at a diplomatic gathering in a precariously perched castle straddling Reichenbach Falls in the Swiss Alps. Reinventing Sir Arthur Conan Doyle's iconic detective, the husband-and-wife writing team of Kieran and Michele Mulroney set a frenzied pace for this fun-filled "last adventure," which director Guy Ritchie cleverly juxtaposes with slow-motion action. It's a rollicking romp that proves the crime-fighting partners' relationship has not yet run its course. 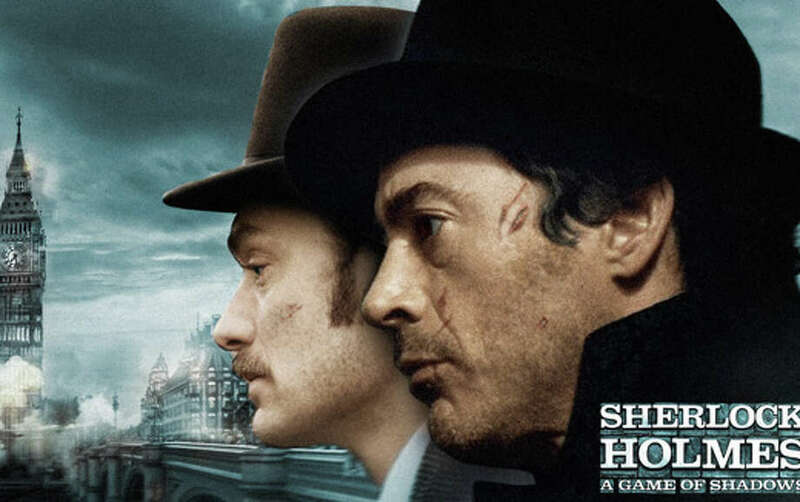 On the Granger Movie Gauge of 1 to 10, "Sherlock Holmes: A Game of Shadows" is a solidly stylish, sassy 7, positioning Downey and Law as the bromance of the year. What's extraordinary about this charming cinematic memoir is Michelle Williams' captivating performance as Marilyn Monroe. In the summer of 1956, a 23-year-old, upper-class aristocrat, Colin Clark (Eddie Redmayne), was determined to get into the movie business. Through a family connection, he managed to become a lowly third-assistant director, running errands for Sir Laurence Olivier (Kenneth Branagh), who was directing and starring in the film version of Terence Rattigan's play "The Prince and the Showgirl," a vehicle which he'd previously performed on-stage with his wife, Vivien Leigh (Julia Ormond). But now the most famous movie star in the world, Marilyn Monroe, was going to play opposite him, along with famous British actress Dame Sybil Thorndike (Judi Dench). Arriving in London with her new husband, playwright Arthur Miller (Dougray Scott), and possessive Method acting coach Paula Strasberg (Zoe Wanamaker), Marilyn (Michelle Williams) was terrified. Sensing his sensitivity to her plight, she turns to bright-eyed, young Colin for comfort, particularly during an idyllic week in the country. There are clues that indicate they had a sexual encounter -- with fragile yet manipulative Marilyn as the seductress -- but that's not pivotal to the plot, except to explain why dazzled Colin's ostensible girlfriend, Lucy (Emma Watson), gets fed up with him. Adapted by Adrian Hodges from documentary filmmaker Colin Clark's book and superficially directed by British TV veteran Simon Curtis, it's essentially one-dimensional, filled with cinematic cliches. Yet Michelle Williams so completely channels Marilyn Monroe's ethereal appeal that her perfectly nuanced performance is dramatically compelling and totally captivating, particularly when her natural spontaneity is contrasted with Kenneth Branagh's unctuous, disciplined demeanor. On the Granger Movie Gauge of 1 to 10, "My Week With Marilyn" is a stunning 7, providing impudent, entertaining observations about a screen icon. In his last comedic role before losing lots of weight, Jonah Hill plays Noah Griffith, who is suspended from college and looking for something to do while spending time at home in New York. Being a nice guy, he agrees to help his divorced mother, Sandy (Jessica Hecht), go out for an evening with her neighbors -- and perhaps meet a nice man -- by taking a job minding the three children of his mother's friend: sexually anxious/over-medicated 13-year-old Slater (Max Records) and his precociously celebrity-obsessed 9-year-old sister Blithe (Landry Bender), along with their recently adopted 10-year-old Hispanic brother from Mexico, rage-filled Rodrigo (Kevin Hernandez), who exhibits extraordinarily destructive behavior. Not only has Noah zero experience in disciplining children, but he's also completely clueless that his manipulative girlfriend, Marisa Lewis (Ari Graynor), is using him, not only sexually but also to obtain illegal substances. So he winds up piling the three kids into the family minivan to drive to a Brooklyn warehouse to pick up cocaine from a crazy drug-dealer, Karl (Sam Rockwell), from whom Rodrigo steals $10,000 worth of the white powder and then spills it. For years, Jonah Hill played virtually the same irresponsible, nerdy schlub in "Superbad," "How To Train Your Dragon" and "Get Him to the Greek," among others. But after scoring critical acclaim as a serious character actor in "Moneyball" and "Cyrus," Hill has now grown far above and beyond this recycled "Uncle Buck"/"Adventures in Babysitting" ridiculousness, formulaically written by first-time scribes Brian Greenwood and Alessandro Tanaka and awkwardly directed by David Gordon Green ("Pineapple Express," "Your Highness") with -- yes -- yet another exploding toilet sequence. Mercifully, it's only 81 minutes long. FYI: A promotional poster includes the so-called "personal" phone number of Jonah Hill: 917-409-7838, on which Hill has recorded a message, speaking to the caller either in character or as himself. On the Granger Movie Gauge of 1 to 10, "The Sitter" is a crass, ludicrous, disappointing 3. Despite its deceptively mainstream title, it's R-rated raunchy and definitely not appropriate viewing for kids.